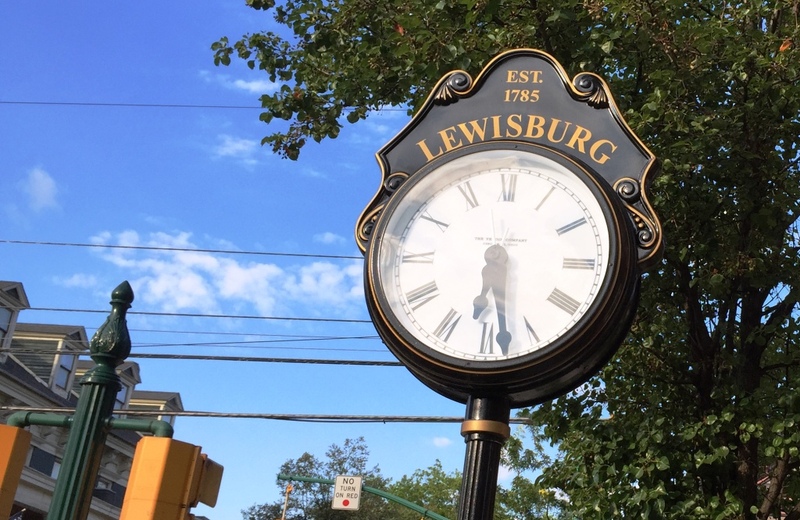 We already talked about our day in the Hudson Valley during traditional adults getaway trip (you can read about it here). Culmination point of the Saturday night was a special dinner. I call it “special” as this is something we always spend time preparing for as part of our getaway. Our ideal scenario is to find a restaurant which would do a special tasting menu for our group, and would allow us to bring our own wines which we would pair with the dishes. More often than not we are successful in this plan – this year was no exception. 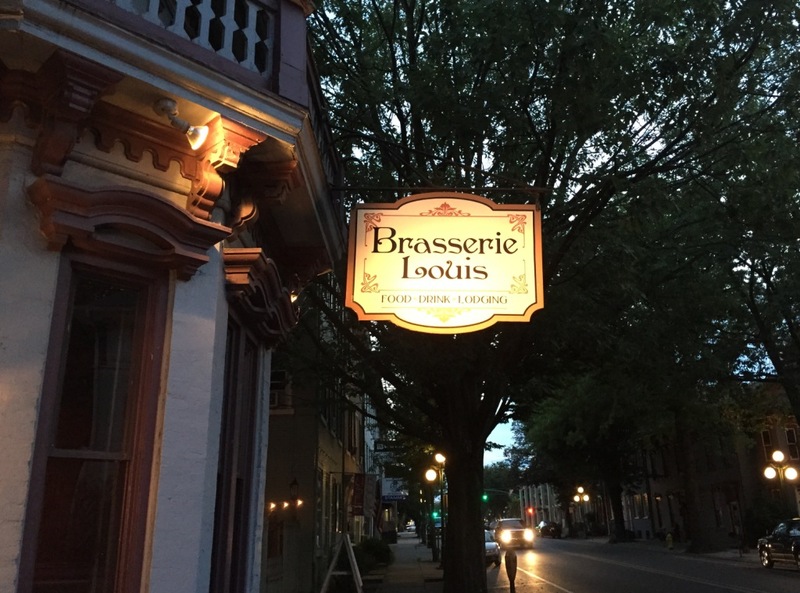 The Mountain View Brasserie restaurant in Greenville, New York agreed to create for us a special tasting menu, and we came up with the wine pairings for all the dishes. Of course, the challenging part is doing the “blind” pairing if you will – all we have is the list of ingredients in the dish, and the pairing is solely based on our imagination. The good thing is that we usually do this “hard work” together with my friend Zak, who owns the wine store, so we have a good number of wine options. We always make an effort to keep the cost reasonable – talking about this dinner, only one of the wines was $25 retail, the rest were $20 or less. We started dinner with NV Rivarose Brut Rosé, Provence, France (Syrah/Grenache blend) which was nice, round and simple, well supporting the conversation. Our first dish was Maryland Crab Cakes served with Lobster Sauce, which was delicious and very generous in size. We paired it with 2014 Templar Cellars Komtur Ekko Pinot Gris, Czech Republic (100% Pinot Gris) – I wrote about this wine before, and while the wine was excellent on its own, the pairing was simply outstanding, with the wine nicely complementing the dish. Our next dish was House-smoked Salmon Napoleon with horseradish cream and gaufrettes garnished with capers and red onion – the dish was interesting, quite tasty, but rather unexpected under the category of “Napoleon”. Our wine pairing was 2015 Notorious Pink Grenache Rosé, Vin de France (100% Grenache), which was medium bodied Rosé, and the pairing was okay, but not mind-blowing (the flavors didn’t fight, but were not enhancing each other either). Warm Hazelnut Crusted Goat Cheese with Market Greens was more successful as a dish, nice crunch on outside contrasting with the goat cheese acidic profile. We used the same wine for the pairing and it worked perfectly, complementing the dish very well. You can’t have dinner without salad, right? We had Grilled Portobello Salad with Roasted Peppers, Fresh Mozzarella Cheese, Tomatoes, Spicy Walnuts, Market Greens with Balsamic Vinaigrette which was very tasty, but most importantly, it paired deliciously with 2014 Sangiovanni Kiara Pecorino Offida DOCG, Marche, Italy (100% Pecorino). Yet another wine I tasted before and loved, and it was perfectly complementing the salad flavors. Vegetable Risotto with Parmigiano-Reggiano Cheese served with Roasted Sea Scallop was one of the absolute favorite dishes – perfectly seared scallop, working nicely with sweet flavors of corn risotto. 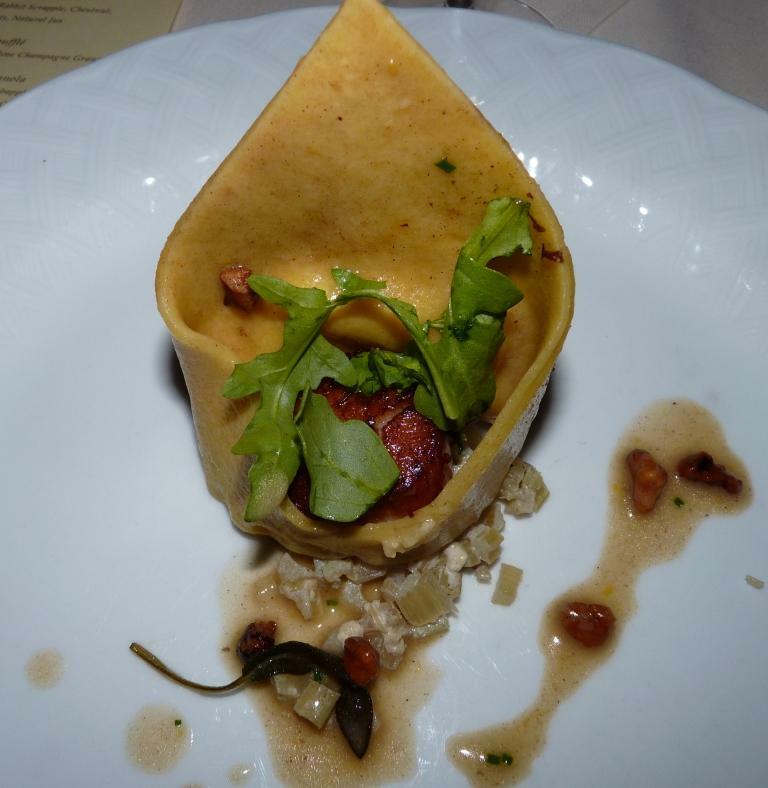 Interestingly enough, we missed the sweetness as dominant taste element in this dish (just one word in our defense – corn was not listed among ingredients), and the same wine, Pecorino, didn’t work that well – it was just an okay pairing. Our next dish was Baked Salmon Fillet with Orange and Olive Butter – again, perfect execution, moist and flavorful fish. The wine, 2011 Portal del Priorat Trossos Tros Blanc, Montsant, Spain (100% Grenache Blanc) was full-bodied, plump and delicious, working very well with the dish. We were definitely looking forward to the Sautéed Wiener Schnitzel with Spaetzle, and the dish didn’t disappoint – very tasty, perfectly seasoned, delicious sauce. The pairing choice was 2013 Templar Cellars Komtur Ekko Pinot Noir, Czech Republic (100% Pinot Noir), yet again the wine I was familiar with – and I’m glad to admit that the pairing was spot on, with the perfect melding of flavors. We finished our main course with Roasted Herb Crusted Rack of Lamb Provencal – I’m sure that even from the quick glance at the picture, you would expect that this was a tasty dish, as you can tell that meat was properly cooked – and you would be right, as it tasted appropriately delicious. Equally appropriate was our choice of wine pairing – succulent 2012 Seigneurs d’Aiguilhe, Côtes de Castillon, Bordeaux (Merlot/Cabernet Franc blend) Bordeaux, classic cassis and mint taste profile and classic complement to the lamb – outstanding pairing. If you look in the middle of the picture on top, you will see a sand clock – what a great and simple way to help you steep that perfect cup of tea? Very thoughtful! Our first dessert was Warm Apple Tart with Vanilla Bean Ice Cream and Caramel Bourbon Sauce – I’m sure you don’t need my lame description here, it was simply indulgent. And for the pairing – you can’t beat one of the best and most universal dessert wine pairings – Moscato d’Asti. We had 2015 Cascinetta Vietti Moscato D’Asti DOCG, Italy (100% Moscato d’Asti) – light, effervescent and clean. Our last dish was Grand Marnier Chocolate Mousse with Fresh Orange Sections – excellent by itself, and pairing very well with 2014 Quady Essencia, California (100% Orange Muscat). I think this was one of the most successful tasting dinners we put together, so for the next year, we have a very difficult task at hand – but we are up for the challenge. Cheers! 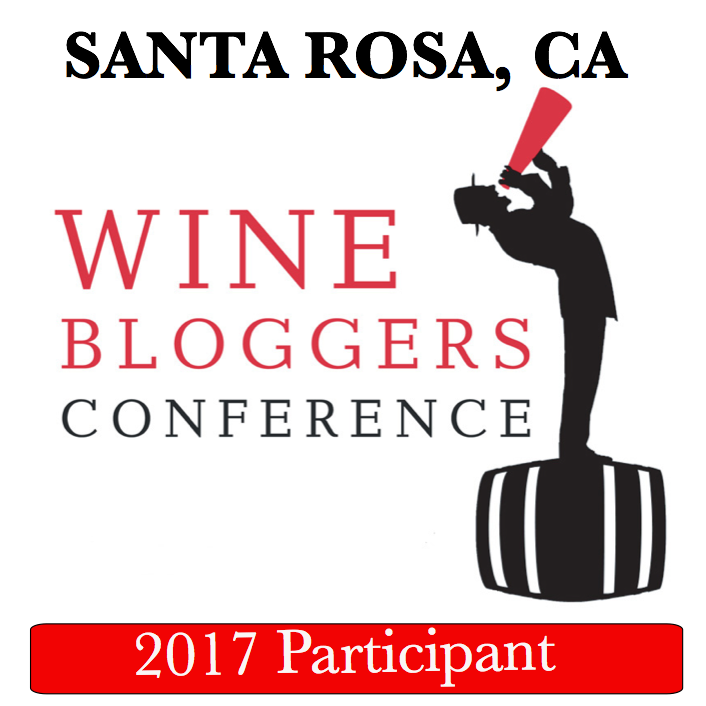 This post is an entry for the 21st Monthly Wine Writing Challenge (#MWWC21), with the theme of “Pairing”. Previous themes in the order of appearance were: Transportation, Trouble, Possession, Oops, Feast, Mystery, Devotion, Luck, Fear, Value, Friend, Local, Serendipity, Tradition, Success, Finish, Epiphany, Crisis, Choice, Variety. Let’s start from the mini quiz – is food and wine pairing an art or a science? Or is it neither and the question makes no sense? I’m sure you can successfully argue both sides, as they do in debate competitions. Technically, cooking process is based on science – heat conduction, protein’s reaction to heat and cold, combining acid and alkaline – we can go on and on, of course the scientific approach to the food and then the pairing can be argued very well. But one and the same dish can be flawlessly composed from the scientific point of view – think about a steak which is perfectly cooked with a beautiful crust – but missing on all the seasoning and having either none or way too much salt – it would require an artistry and magic of the Chef to make it a wow food experience. So may be food and wine pairing is an art after all? I don’t have an answer, and I don’t believe it is even important. The problem is that in many cases, that “food and wine pairing”, which is typically sought out and praised, is not possible, not universal and even not needed. Yes, there are rules for the pairing of wine and food. Contrast, complement, balance of the body of the wine with the perception of the “weight” of the food, tannins and fat and so on. The rules work well when you create a tasting menu and pair each dish individually with the very specific wine, based on practical trial and error. However, once you try to extend your recommendation to say “try this stew with some Syrah wine”, that begs only one question – really? And overbearing Shiraz from Australia, or earthy, spicy and tremendously restrained Côte-Rôtie or espresso loaded Syrah from Santa Ynez Valley – which one? Here is another example, simply a personal one. At a restaurant, my first food preference is seafood – scallops, bouillabaisse, fish – anything. My wife typically prefers meat, and so do many of our friends. Going by the standard rules (white with fish etc. 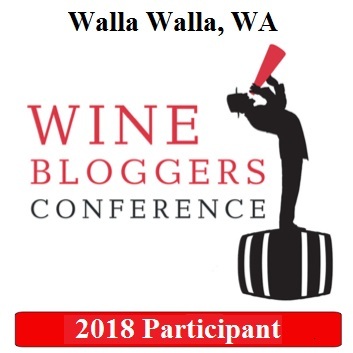 ), we are either stuck with water or have to order wine by the glass, and ordering wine by the glass is typically not something I enjoy doing – very often, “by the glass” list is short, boring and grossly overpriced. So instead of trying to pair wine with the food (don’t get me wrong – I like the “spot-on” pairing as much as any other foodie and oenophile), I prefer to pair the wine with the moment – a good bottle of wine which doesn’t match the food is still a lot better than crappy wine which would denigrate the experience. Still not convinced? Think about a simple situation – old friends are coming for a visit, and you know that these friends like wine. Yes, I’m sure you will give some thought to the food, however, there is a good chance that you will comb your cellar over and over again in a search of the wines to create the meaningful wine program for the evening, even if the whole dinner would consist of one dish. You will spend time and time again thinking about your friends and trying to come up with a perfect, special, moment-appropriate and moment-enhancing wines. Wine is an emotional connector. Wine elevates our experiences, making them a lot more memorable. You might have problem remembering what dish you had at a restaurant, but if the bottle of wine made you say “wow” on the first sip, there is a good chance that the special moment will stay in your memory, thanks to that special pairing which took place. Yes, when food is well paired with wine, it is really a special experience. But food and wine pairing which doesn’t work is really not the end of the world, it is still just a nuisance – and a learning experience, if you will. When the wine pairs well with the moments and the people, that’s when the memories are created, and that, as MasterCard likes to teach us, is priceless. Let’s drink to lots of special moments in our lives. Cheers! As Fall settling in the most of the Northern Hemisphere (slowly, I have to admit – it is still very warm and green here in Connecticut), the Spring is coming to the people of Southern Hemisphere, who are I’m sure very happy to forget the cold and embrace the sun. With Spring comes The Dinner Party Collective Spring Menu (if you need more information about The Dinner Party Collective, please see one of my previous posts about TDPC, as we call it for short). I think all the dishes are absolutely spectacular, and I hope you are all already inviting your friends over for a delicious dinner (and let me know how the wine pairings would work). This time around, I want to take a liberty to add a little trick, if you will, to one of the dishes on this menu – a Smoked Salmon Salad created by Margot from Gather and Graze. You see, my family loves smoked salmon in any shape and form – on the bagel, in the salad, in the appetizer, anywhere. When you buy smoked salmon from the store, there are couple of issues. First one is the taste and overall quality – sometimes it can be oversalted, dry or even rubbery. 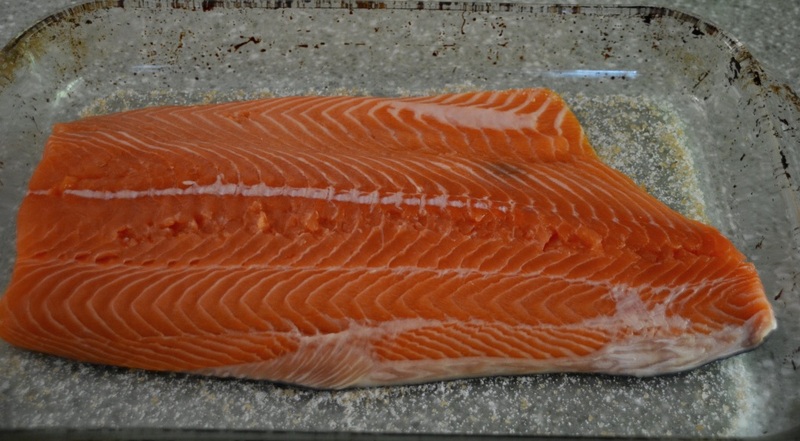 Second, the better quality smoked salmon is often quite expensive – Fairway store in Stamford charges $24 – $30 per pound of that smoked salmon. 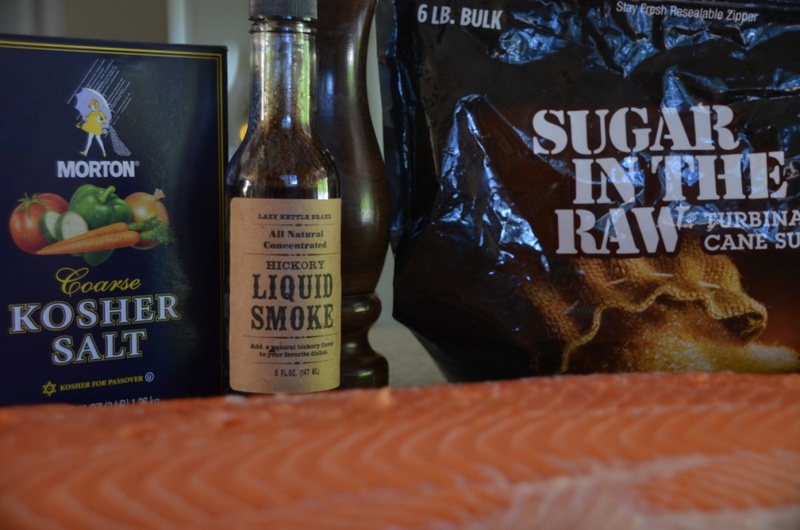 So instead of dealing with uncertain quality and high prices, you can make smoked salmon on your own – it is very easy – and you fully control the flavor profile. That’s right – when making smoked salmon on your own ( and you don’t have to make it taste “smoked” if you don’t like it), you can add any spices – dill, pepper, herbs – anything – and it is really easy to make. Above you see everything you need – please note the bottle of Liquid Smoke there – available at most of the supermarkets or you can order it online. Few drops will impart smoke flavor on any dish you are making. Drain the liquid (as much as you easily can, don’t strain it completely). 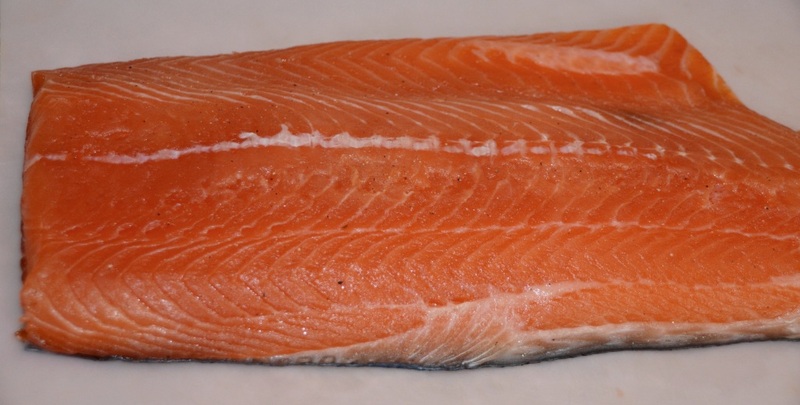 Technically, salmon is now ready to eat – it is completely cured. 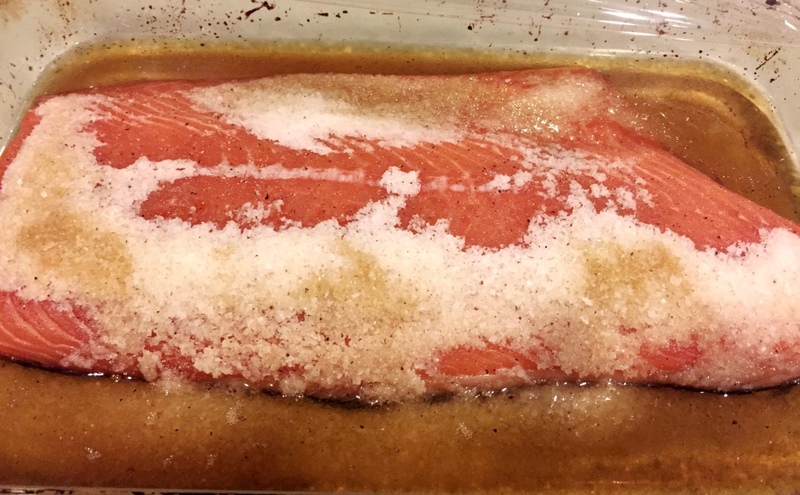 From now on, I like to make it “smoked” so I add a few drops of Liquid Smoke all over salmon and around, cover with plastic wrap and put it in the fridge for another 12 hours. 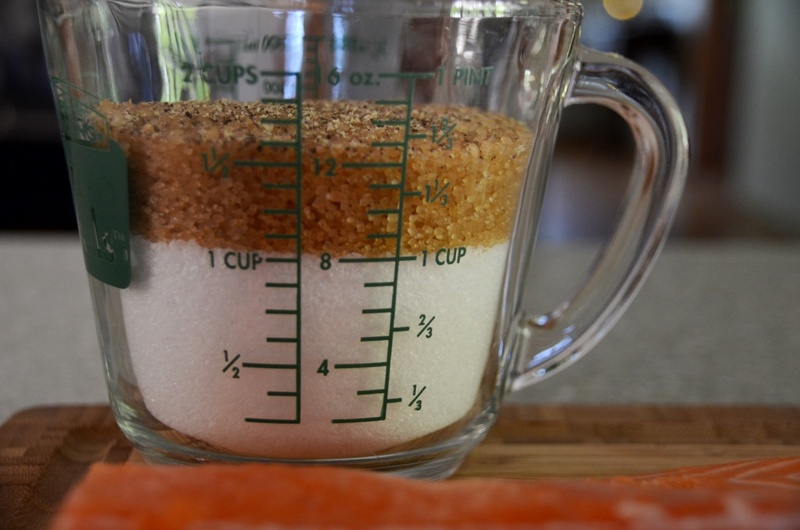 Important note – the longer you will keep salmon with the salt, the drier and denser it will become, as it will lose more juice. I like to give it even longer rest time if I’m not too hungry, so I would typically wrap it completely into the plastic wrap and put it back in the fridge for a few hours. Salt dries the surface completely, so by letting the salmon rest, it will redistribute the juices so it will become all moist and delicious. 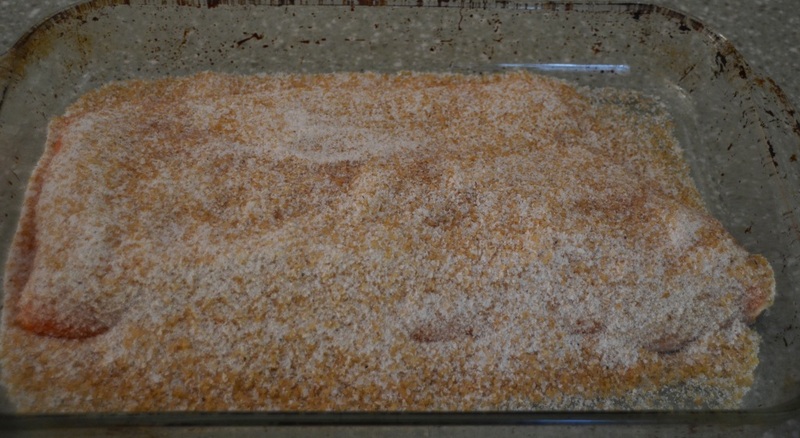 Last step – slice and enjoy! I would typically slice it off the skin as needed, and keep the rest wrapped in the plastic wrap in the fridge. As it is cured, it will last for a pretty long time – between a week and two for sure. It is also very easy to freeze as it is, right in the plastic wrap – and it can be thawed quickly as needed. 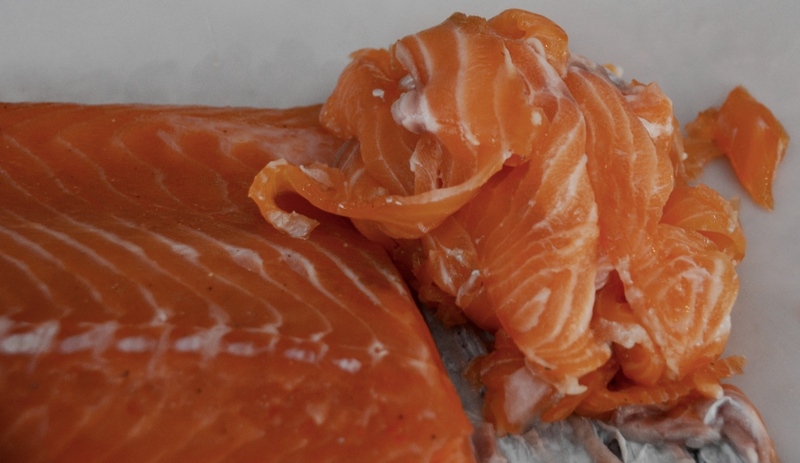 There you have it my friends – a simple smoked salmon recipe. Yes, do that at home! If you will decide to make it – let me know how it will come out. Cheers! A quick update on the fun project I had been involved with – The Dinner Party Collective (TDPC for short). 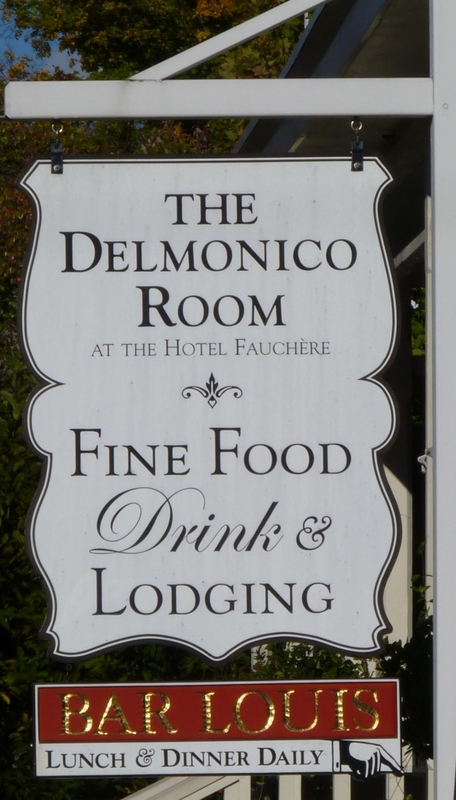 For those of you unfamiliar with TDPC – it is a collaborative project of food and wine bloggers, aimed at creating full dinner menus with focus on seasonal ingredients in both northern and southern hemispheres, and with all the dishes on the menu coming with suggested wine pairings. TDPC is a brain child of Margot from Gather and Graze, which started early in 2015. TDPC was mentioned in the WordPress article in July as one of the 4 food blogs to watch. Earlier in the year, we published a set of Winter and Summer menus. All the recipes include wine pairing notes and suggestions from Stefano (Flora’s Table, Clicks & Corks). Spring menu overview will be coming out tomorrow, with the wine pairings and all the dishes to follow. Happy cooking! Cheers! 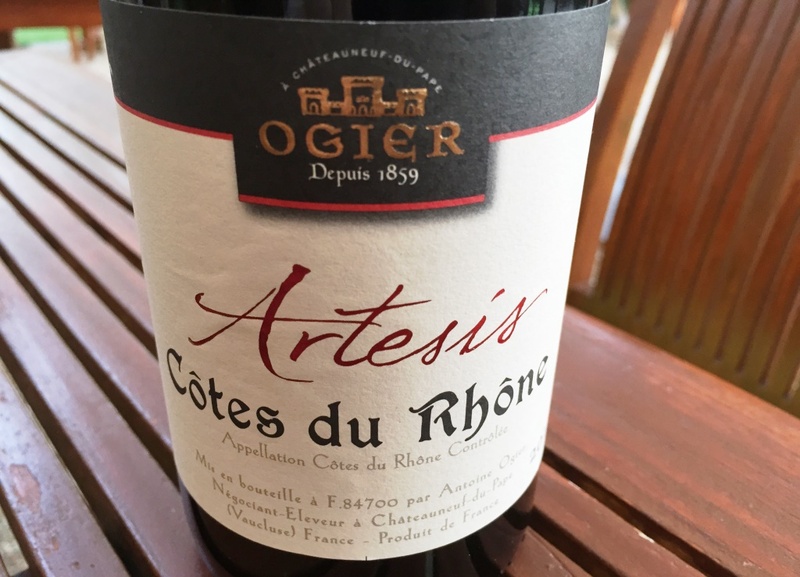 What do you think of Côtes du Rhône wines? Côtes du Rhône (I like to call them CdR for short) are some of my favorite home wines. A “little brother” of Chateauneuf-du-Pape, they often offer similar, may be a bit less expressive taste profile, usually at a fraction of a price. They are also quite versatile with food, offering a wide pairing range, from lamb to game to cheeses. What was even better than just a nice glass of wine was that wine worked perfectly with food – this was an accidental success, as I didn’t think about the wine at all while ordering the food. The wine paired spot on with the Rabbit Pate, elevating each bite. It did the same thing with Grilled Veal with Creamy Mushroom Sauce. Believe it or not, but it was not even disturbed by an interesting dessert – a Pineapple Carpaccio (called on the menu “raw marinated pineapple”) with Lime Sorbet. All I can say that this was probably one of the most versatile wines I ever had – kudos to the winemaker for crafting such food friendly wines – I guess 155 years of history mean something. Before we part, I want to live you with a couple of curiosities. Below you will see the back label of that bottle of wine, providing sulfates warning in 21 languages (I already shared that on Twitter). I find this interesting and a bit ridiculous (sorry – wine always contains sulfates, and no, they don’t cause the headache). The second picture shows an extremely thoughtful presentation of the condiments. I shared this on Twitter too, noting that I like the classy presentation, something which French mastered perfectly, only to be ridiculed by someone asking me if ketchup is a French food. Of course it is not, but think about how many times you were presented with the bottle of ketchup at a restaurant, only to think “where should I put it to – on the plate or directly on the fries” – by the way, both are equally uncomfortable choices? In this case, the problem is solved in the best possible way – here is your personal bottle, and you don’t need to deal with any puzzles, just enjoy your food. Voilà! I’m done with my “notes from the road”. If you are in US, happy few last hours of the Labor Day holiday weekend. Until the next time – cheers! So we had 7 course tasting menu with two very small “single byte” dishes at the beginning and in the middle of the dinner. Menu focus was on the local, seasonal and fresh ingredients, and I think mission was accomplished quite well. We selected 7 different wines to pair with the dishes – 4 whites, 3 reds. We made a lot of good decisions with this set – but more about it later. This was also a great selection, all worked very well with food – so lets get some details. The first dish in tasting was Tortelloni A La Zucca (Seared Diver Scallop, Black Walnut, Sage Butter). Wine pairing – Rousette de Savoie Altesse. I would honestly question composition of the dish, as pumpkin tortelloni didn’t do anything to the scallop, tortelloni looked almost as a presentation piece. At the same time, wine worked very well with all of the components in the dish – apple, leeches and earthiness worked well with pumpkin filling, and wine had enough fruit and acidity to complement scallop. One important thing to mention here – with this wine I was able to make a progress in the treble journey, as Altesse is a grape from Savoie which I never tasted before. Color me happy – 273. 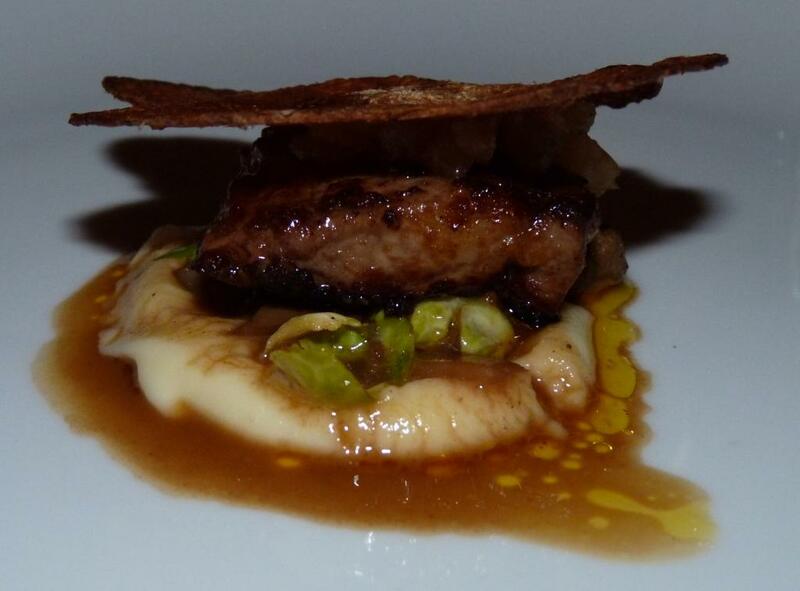 The next dish was Foie Gras De Canard (Porcini Mushroom, Brussles, Pear, Pomme Maxim). 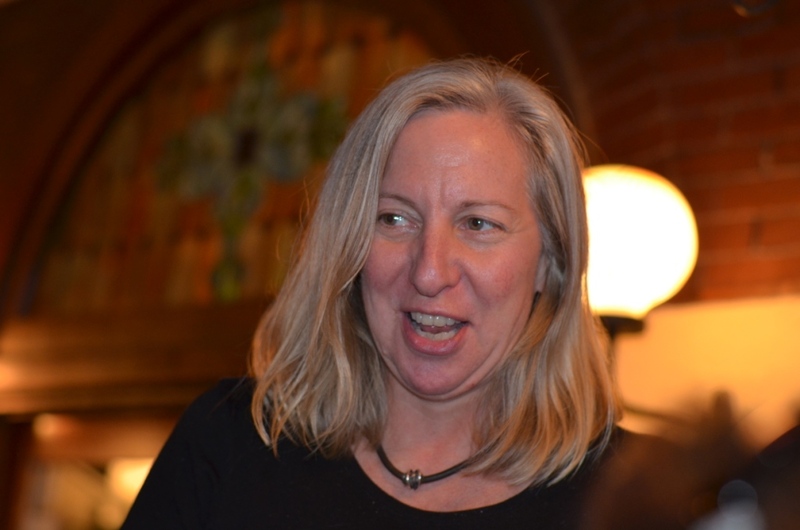 Wine pairing – Staglin Salus Chardonnay. As we didn’t miss a single pairing ( pat on the shoulder), at least in my opinion, I will omit redundant [great pairing] in front of each description. Salus is produced by Staglin Family, one of California cult wine producers from Napa Valley (Staglin Family Estate Cabernet Sauvignon 2007 just got WS 98 rating). 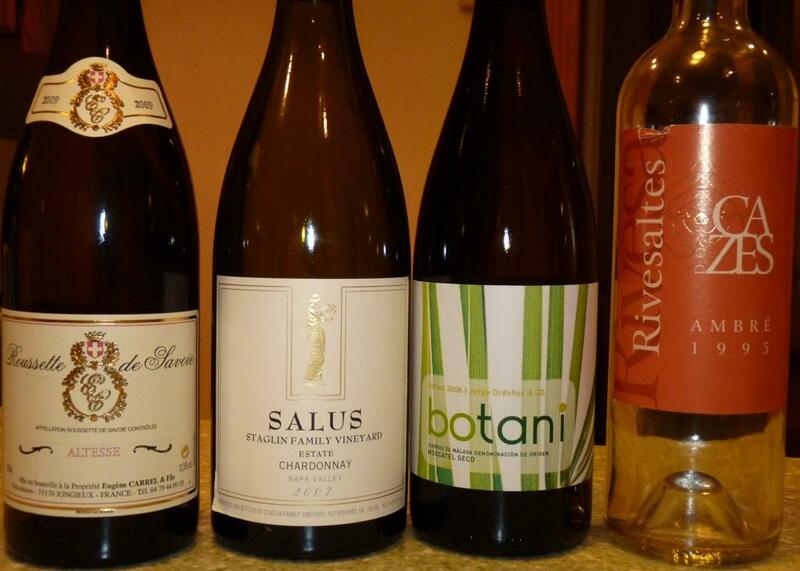 Salus was one of the most beautiful chardonnays I tasted lately. Vanilla, butter, caramel, toasted oak and acidity of the wine worked perfectly with heavy but creamy texture of the foie gras. Next dish was Roasted Black Sea Bass (Caramelized Sunchoke, Garden Chard, Cabernet Franc Emulsion). 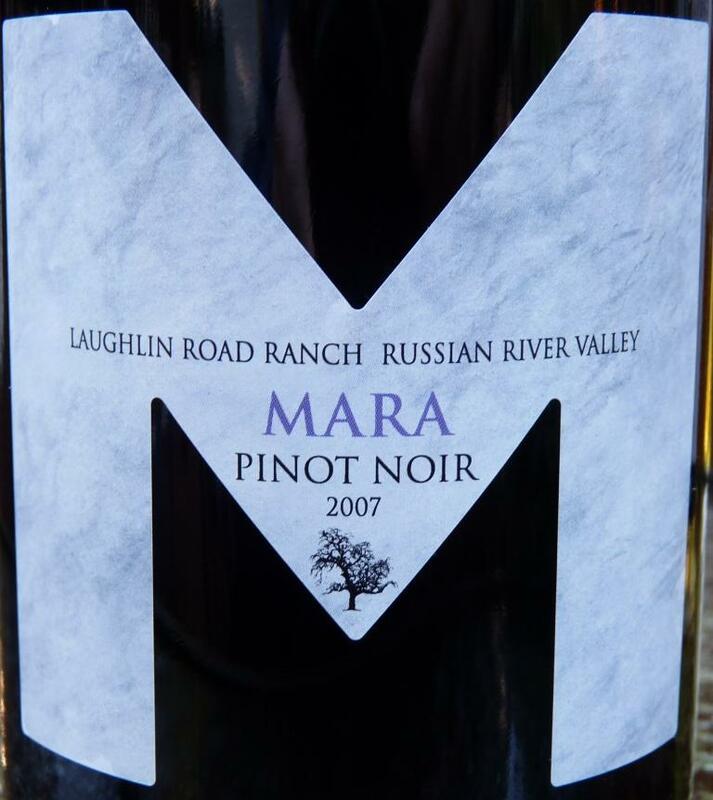 Wine pairing – Mara Pinot Noir. 1. It was one of the best versions of Roasted Sea Bass I ever had. So, by the time I realized that I didn’t get a picture of the dish, it was too late. 2. And I guess it was also too late because everybody got carried away after taking a sip of Mara Pinot Noir. Mara Pinot Noir was really a centerpiece of the tasting. “Oh my god” was major phrase at the table after the first sip of the wine. I don’t think that wine should be described in terms of color, fruit and acidity. This wine should be described in terms of opulence and decadence it cast upon the table. “Total and absolute balance” would be the right way to put it. Anyway, if you can find a bottle, you should experience it for yourself ( about 250 cases total production). In my “drinkability” ratings it is defnitely a 9+. 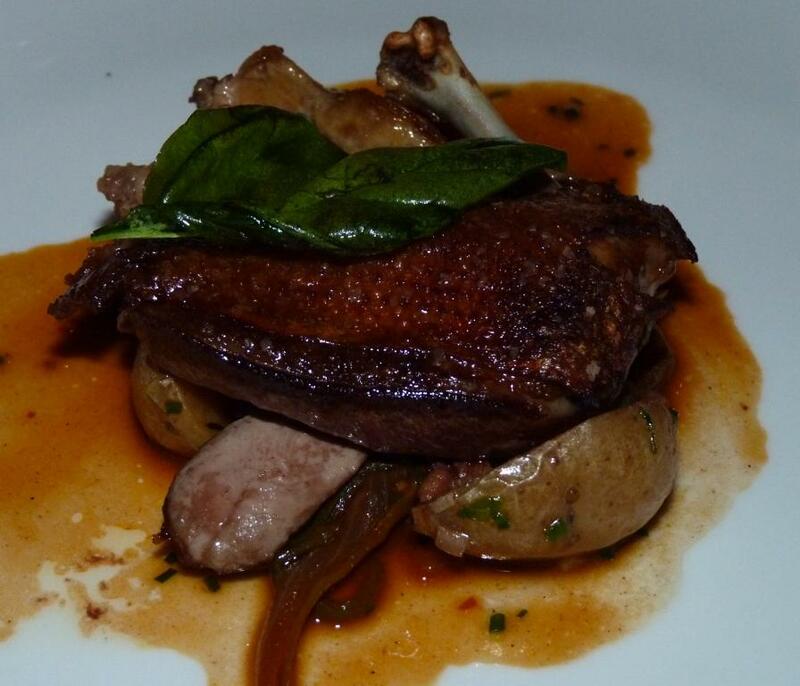 Next dish: Sautéed Squab (Confir Potatoes, Red Peppers, Serrano Ham). 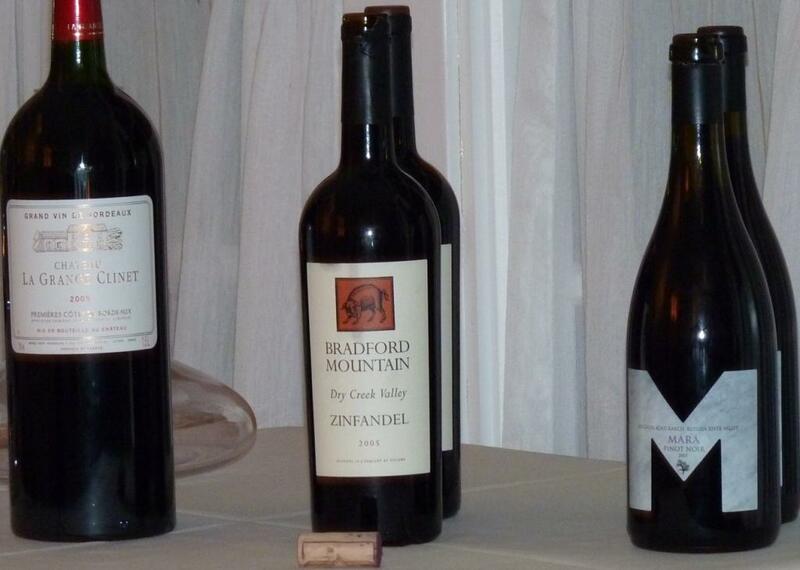 Wine pairing – Bradford Mountain Zinfandel. Deep earthy and gamey flavors of the dish ( tasted almost like a fried liver), were complimented well by spices and acidity of the wine. This was definitely a good combination. 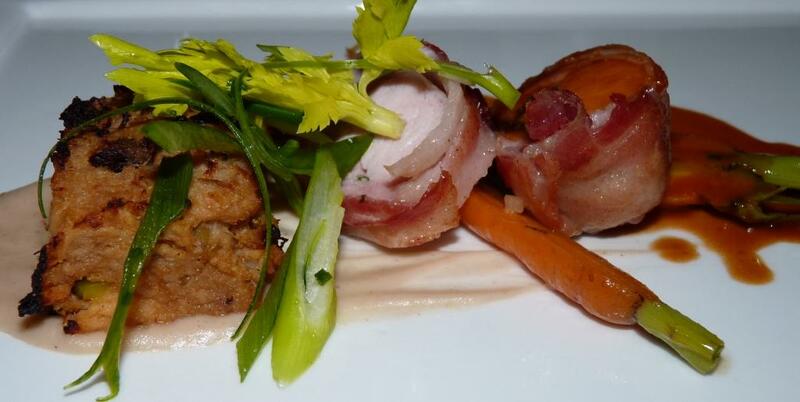 Following on, major entree: Duo of Farm Raised Rabbit (Bacon Wrapped Loin, Rabbit Scrapple, Chestnut, Garden Carrots, Natural Jus). Wine pairing – Chateau La Grange Clinet Premier Cotes de Bordeaux. Bordeaux had being nicely decanted, so it was open enough in time for this dish being served. Coming from magnificent 2005 vintage, this wine can be drunk right now, but will improve with some time in the cellar. The wine worked well with the flavors of the dish – combination of tender, a bit gamey loin and fresh garden vegetables was well complemented by dark fruit flavors in the Bordeaux. And now it is time for desserts: Cheese Soufflé (Pinot Noir Must, Grape Aspic, Rose Champagne Granite). Wine pairing – Botani Sierras de Màlaga. I discovered Botani Muscat at the dinner at The Capital Grille. This wine delivers incredibly bright acidity and fruit combination, every sip feels like it is full of live. That acidity was instrumental in this pairing. The wine worked quite well with both Granite and Souffle components of the dessert. 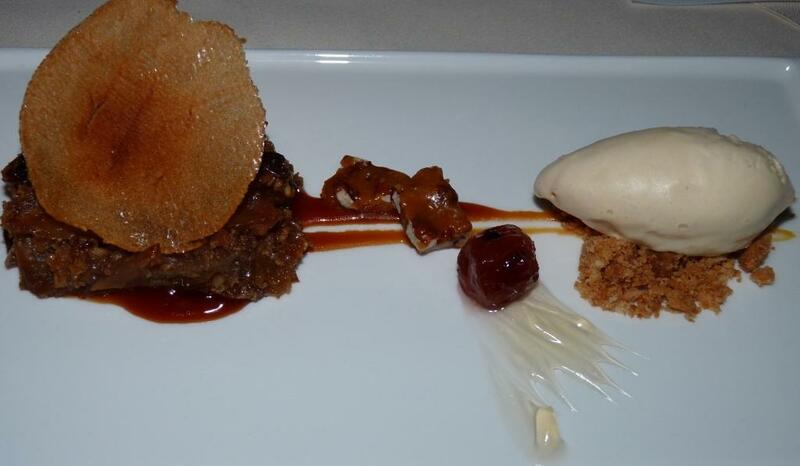 And last, but not least, one more dessert: Gala Apple and Granola (Apple Jack Caramel, Foraged Crabapple Confit, Cinnamon Gel, Pecan Brittle, Mulled Cider Ice Cream). Wine pairing: Ambré Riversaltes. If Mara Pinot Noir was best of tasting, then this was the most interesting wine. This wine, made out of White Grenache, is made in the Solera style – it spent 7 years in the open tubs, developing delicate flavors. Ambré Riversaltes exhibited fresh and balanced flavors of toasted apple and caramel, which perfectly worked with “apple many styles” flavors of the dessert.